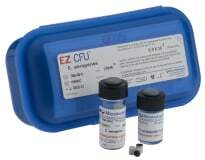 With EZ-CFU ready-to-use reference cultures, Growth Promotion Testing doesn’t have to be a hassle. Delivering 10-100 CFU per 0.1 ml inoculum, following a simple 1:10 dilution step, each microorganism suspension provides up to 90 tests. These handy kits allow for fast, reliable Growth Promotion Testing. Plus, EZ-CFU microorganisms are just three passages from the reference strains. All in all, EZ-CFU makes meeting Pharmacopeia standards for Growth Promotion Testing easier than ever.